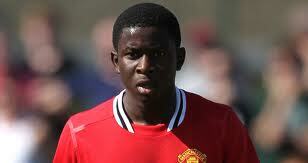 Larnell Cole scored the single goal. Manchester United have booked themselves a place in the Barclays U21 Premier League semi finals after beating West Bromwich Albion at Old Trafford on Monday evening. It was Larnell Cole’s single strike that put them there in the 8th minute with crafty build-up from Tom Cleverley and Alex Buttner and eventually a pass from Jesse Lingard left Cole to just place it into the net. Luke Daniels performed magnificently in the West Brom goal to keep out any further efforts, most notably from Ryan Tunicliffe. Ben Amos down the opposite end did equally as well and denied Adil Nabi and Romain Sawyers, who had fine efforts. West Brom’s development manager David Oldfield said: “We didn’t show enough intensity from the start and we conceded an average goal, which we had opportunities to stop. “We slowly came into the game and in the second half we showed a better intensity and our passing improved. “We created a couple of half chances but didn’t show enough threat on goal. Manchester United will play their final group match on 3rd May against Liverpool and then the top three of the elite group will join Everton in the semi-finals.